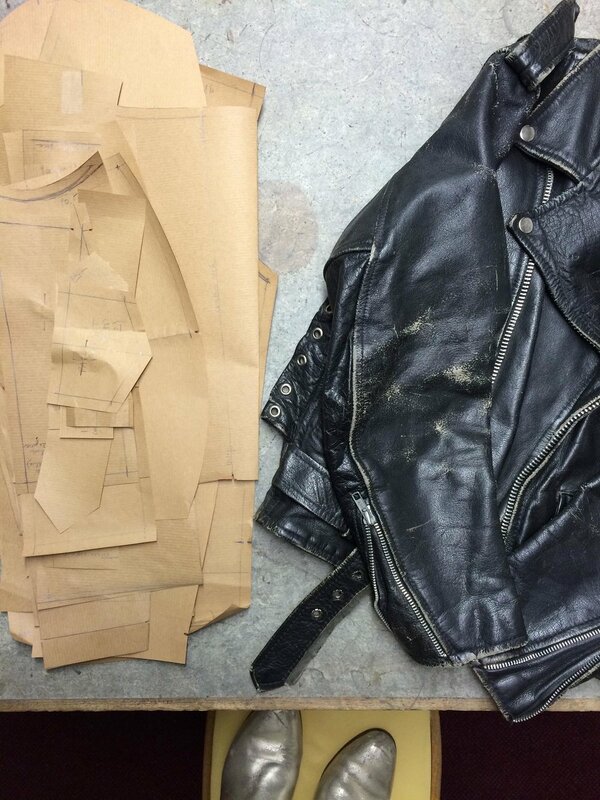 It began with a journey familiar to many – the search for the perfect motorcycle jacket. Specifically, a vintage one. The impossible, often futile hunt for that perfect combination of patina and fit and soul that can only be found in something worn and loved by someone else, decades ago. My search finally came to an end on a trip to North America, hunting for vintage in the great city of Portland, Oregon. There, among the rails of a local second-hand emporium, I finally found The One. The only problem? It stank. Terribly. Replacing the lining didn't help. Neither did hanging it to bask in the sun, dousing it in baking soda, cleaning it tenderly with leather soap nor leaving it to doze with sprigs of lavender for extended periods of time. Nothing worked. She had lived a full life. Off to the inspiration pile she went. Then I met a Savile Row Tailor. Some time later, at a wedding in London, I crossed paths with an expert patternmaker who specializes in leather. Together we examined the pattern of my well-worn Perfecto and set about recreating that perfect design, tweaking the fit and altering details to create a contemporary relic with real roots. "Start copying what you love. Copy copy copy copy. At the end of the copy, you will find yourself." What began as a personal quest for that one iconic piece led to a gorgeous jacket adored by friends and strangers from New York to San Francisco, London to Paris. I launched Kelly Miller Paris to help others fulfill their own hunt for that perfect leather jacket – one that will age beautifully and lend every look an authenticity that can prove elusive in modern clothing. You're just a few steps away from your perfect perfecto.